Do We Cause Our Own Illnesses? There is always a teaching to be found in illness. It doesn’t mean that teaching is the purpose of illness – who knows what the purpose of illness is – or that sick people are more in need of that advice. It is just an inevitable outcome of the profound transformations that comes with the territory. In the terrible clarity of the nearness of death, ignorance – as it exists in ourselves and in our world – is stripped away if only for a moment, and our lives condense, collapse and re-coalesce, requiring changes. We are responsible to those changes. We are not responsible for our illnesses, we are responsible to them – to what they offer and require of all of us, sick and well alike. “We are responible to those changes.” I like that. There are great lessons to be learned in life and illness is just another teacher. When cancer overtook me, I wondered – as we all do, I suspect – why this happened to me. Was it the smoking I’d done in my past, was it too much salt, was it a difficult relationship with my Mother, was it “having strayed so far off track from one’s inherent line of development with regard to the breakdown and digestion of life that the body must help the forgotten/suppressed subjects to break through again…not getting what one is entitled to” (1). Any of these, all of these in combination? Elemental chance, environmental pollution? Knowing the cause(s) of pancreatic cancer or any other disease will go miles with helping us find a cure. But knowing the cause at this moment won’t help us deal with the illness, unless, of course, there is a connection between our emotions and spirit and disease. Then it’s important. So I’m pretty happy to follow that trail and seek out what is underlying any illness I have. I don’t count on it curing me, but it’s another brick in the wall of healing and I’m certainly willing to explore myself and my relationship to the world in that light. I have gone to talk therapy around this, I have had spiritual journeys on this, I have taken a class with Dr. Dahlke and I continue to read very interesting books about it. Most of what I’ve taken in from others seems pretty simplistic to me. “If you’re constipated, you’re holding back on life.” Well, first, duh. But second, what it means to me may be very different from what it means to you. It’s like dream intrepreation – an elephant to you may mean different things to me. So like anything else, it’s seldom a clear path. You certainly need to do introspection, dig into your phyche, talk it out with others. I have a picture on my wall from a medieval Book of Hours. 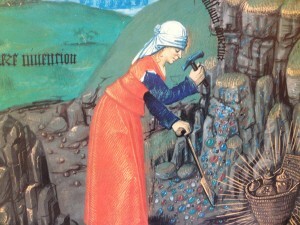 There is this beautifully dressed woman with a pick, digging gems from a hard earth. That’s how I think of this work: you’ve got to dig but what you may find are gems. Just this last weekend, I became ill with Takotsubo Cardiomyopathy. Lying in the hospital bed, it struck me that this was as much a message as an illness. I had been stressing too much, holding way to much anxiety and my body suffered. But it also made me realize that I needed to change the way I was doing things. I can be hardheaded and stubborn; I believe now that this was the only way I was going to get the message to change. Illness may certainly be a symbol speaking to the mind – of just that – a life out of balance, pointing the way to the need to change something within or without. I certainly can’t discount it: too many people have gotten well after making significant life changes. If you are interested in reading more about this, I have a section in Resources/Books, CDs, DVDs that list several different resources. (1) From the Sym/Sym app. Disease as a Symbol by Ruediger Dahlke, M.D.